Photo stop at burj Al Arab beach. Passing and photo stop at Palm Island. Photo stop at Burg Al Khalifa. Passing by Sheikh Mohammad palace. Passing by Emirates palace hotel. Veg lunch at indian restaurant. Ferrari Park with entry ticket. 19 rides free of Ferrari Park.Airfare. Evening Pick for Desert Safari with BBQ Dinner by Land Cruiser (Unique tours) between 1515 - 1545 hrs on SIC basis. 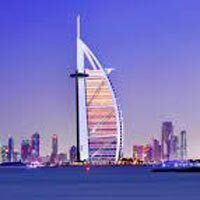 Morning departure transfer (on SIC basis) from hotel to Dubai international Airport. Rates Not Applicable during Dubai Festival.